It was 2002. That’s when we first went on a long trip (before that, my memory was more volatile than it is now, so I don’t remember where we went before that). And that was when we had first visited Agra. But I only have faint memories of Taj Mahal from that trip. We travelled to Agra from Delhi via road. Agra is an older city. Its age is reflected by its road patterns and its buildings. Our hotel reservations had been done by one of my uncles, and the hotel was situated a kilometre away from the Taj! It was a bit isolated from the city and hence quieter and cooler. The four of us had lunch and then went to Agra Fort. We decided to opt for an audio guide machine for the first time. An audio guide is an audio device. Places are numbered throughout a heritage site (with numbered boards) and if you type in the number on your device, a pre-recorded voice narrates various facts about that specific place. This is an amazing way of navigating your way through a heritage site, especially since there are audio effects to make your visit more realistic and notable. Agra fort is huge. It’s more of like a city with walls. In fact, one can get lost after a certain point (and I am saying this, because I did get lost for a few minutes), if one moves around without keeping the pathways in mind. Shah Jahan was imprisoned inside Musamman Burj and there was a single mirror which reflected the Mahal and made it visible to him. On returning, we spent the evening conversing, listening to ‘RJ Sayan’ (even Duda listened and laughed, sometimes with slight embarrassment) and drinking tea (coffee, in my case). Stay connected to my blog for the next four days. 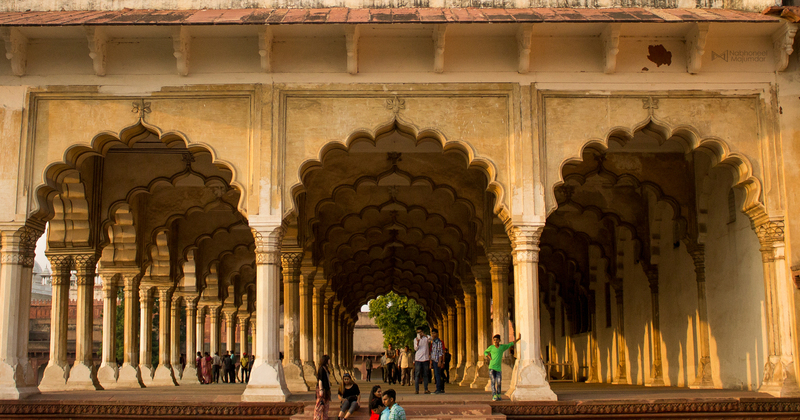 I’ll publish two new posts about our stay in Agra featuring the Taj Mahal and Fatehpur Sikri.